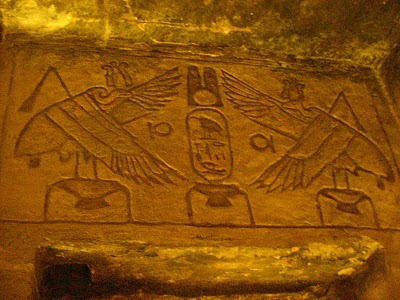 The Temple of Hathor – Abu Simbel. 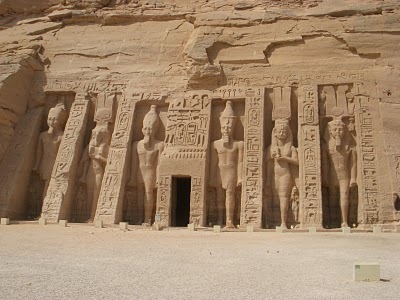 Here is the Temple of Hathor which is in Abu Simbel next to the Great Temple of Ramses II. This temple was also cut out of the small mountain which is the area. Remember what I mentioned about the two anointed ones and the Great Almighty Divine Creator – here is another fine example. The omnipresent of the Almighty, and the two anointed ones. The light at the right hand and the darkness at the left hand. Each anointed one will rule their kingdom once the separation of the light and darkness takes place. 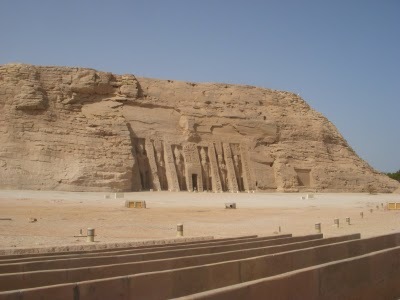 Here is a picture of the two temples, The Temple of Ramses on the left and of Hathor on the right, both temples cut into each mountain. 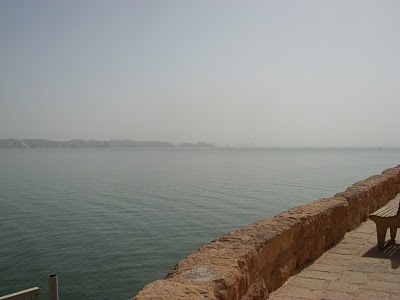 This is a picture of Lake Nasser facing toward The Sudan. The high dam in Aswan created the lake at the same time destroyed many Nubian villages along the Nile south of Aswan. 3/2/08 I just got done watching the MacBook Air Guided Tour on the Internet, very nice I must say. The Air will be a great travel computer, if and when I buy one. The computer is less then one inch thick. 3/3/08 I found a place here in Cairo that carry the new computer and went to see it today. This is the type of computer to travel with, although this Apple store here in Cairo is charging $500.00 more then in America. If I would order one in America and send through my mail forwarding service, I would have to pay customs fees. I will wait until I get to Europe, although since the Euro is so very high it would also cost me more. One alternative is finding some work in Europe and just saving for a MacBook Air, therefore I will wait until the time is right. I have been catching up on some needed rest, taking a nap each day – my semi-quite, cozy room helps a lot. I am getting ready to head out for the last leg of traveling Egypt. At this time it looks like I will leave Cairo for the last time this Saturday or Sunday to Port Said, I am having lunch with my Egyptian female friend on Friday. 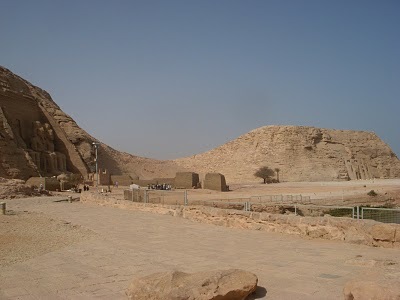 While I am in Cairo I am going to try to upload all the remaining pictures on shutterfly from Upper Egypt, also I want to see the Pyramids one last time and go into the second pyramid. I went to the Embassy of Syria for a visa and they said – No. I might stick to my original plan, I will figure that out once I am in Jordan. It looks like I’ve landed on a couch-surfing situation in Dahab. The women I contacted will be heading out to travel Egypt from 3/23 through 4/1, she said I could just stay at her place myself. We will be confirming this soon. If this works out then that will be the plan. Starting in April I will head to Mount Sinai, then back to Dahab and finally to Nuweiba, which is also a nice kick back place before I take the boat to Jordan. Many people have looked at me like I am nuts for traveling Egypt for up to six months – Egypt is more of a challenging country. Staying an extended time teaches, not only patience, but also long-suffering. Long-suffering is a key quality to cultivate when traveling long term within alien cultures. Certainly I could just get on a plane and go anywhere at anytime, but this is not the way I’m traveling. I have met a few travelers that are traveling for ten months or so – the places they fly to within this time is really wild, although that is what they planned. One couple from Canada said it took them three months to get into the groove of traveling. Flying from place to place and hitting so many countries might have been the cause. With a time constriction, though, most people want to visit many countries as possible. When long term travelers see my gear, they really don’t what to think, although I do have everything I need – even a down jacket and a rain jacket that breaks the wind. Both items compact very small. Indeed, everybody has different ideas of how to travel, which not any one’s idea is better than the other. The two very most important items to not forget are ear-plugs and a micro absorbent towel. My backpack is the very best, you can look through the archives regarding the post of the pack I decided to go with. By the way, when we were heading back to Aswan in the felucca, a captain’s boat, holding twelve tourists went under, all their bags were on the bottom of the Nile, some of them got injured. It was to windy to sail down river – the captain was only thinking money, not safety. So how should this be viewed? I have ran into many travelers that have ran into problems during their short holiday. Could it be karma? The idea that they were just suppose to experience a disagreeable incident? can this be fair to conclude with? Everything under the sun happens for a reason – each person needs to question when something disagreeable happens – what is the reason? what lesson does this incident teach? Very sad to see something this happen, although becoming overly-sympathetic is not healthy. Everything happens for a reason. The way a person lives their life will cause karma on a holiday – good or bad. Next post: The Last Farewell – Cairo – The Pyramids. 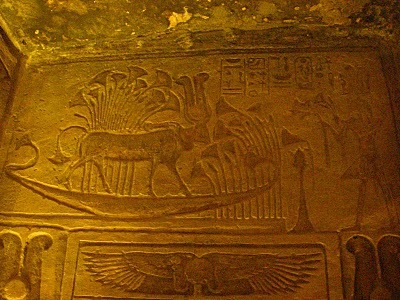 Previous post: The Temple of Isis at Philae – Aswan.